I am an American white male, age 71, happily married, father of two wonderful girls, and a retired scientist (chemist and hydrologist) and manager. I spent 34 1/2 years with U.S. Geological Survey in a career that was always interesting. I never had a day where I dreaded going to work. It was always an environment of learning and interesting work. And I worked with may truly wonderful, dedicated people. Few people are so blessed in their family and job. I hear so many folks complain about our government, but I am here to tell you that there are some really fine, competent, dedicated Federal agencies. U.S. Geological Survey is one of them. So is U.S. Fish and Wildlife Service. That bureau could stretch a dollar further than any other agency I ever worked with. Congress was downright niggardly with their budgets, and they bought army surplus desks, file cabinets, vehicles, etc., and made do. And their science was really superb. Of course, I will not deny that some agencies were downright terrible. General Services Administration comes quickly to mind. Even they had some highly dedicated people. But overall, they did a poor job with their mission. U.S. Bureau of Reclamation had some really fine people, but their pervasive dishonesty with the public really turned me off. My years in a Federal bureaucracy taught me many things about the bureaus and the politicians. My hat is off to the bureaucrats. Many Congressmen use the bureaus as scapegoats. Here's a typical example, fictional as to the exact instance, but absolutely true in terms of the way things work. Congressman Blowhard has a meeting in the morning with Sierra Club members. They ask him why a local coal-fired power plant is allowed to release coal wash water into a prime salmon and steelhead stream. The Sierra Club members have monitored the water, and it is jet black with coal fines. Yet the power plant, who is allowed to self monitor, claims the turbidity is only 10 units -- essentially clear water. Congressman Blowhard doesn't know why the power plant is releasing nasty water, but he has a ready answer. He replies, "Yes, I am aware of the issue, and I have spoken to EPA about tracking this issue more closely and giving me a report. In fact, I should have had that report already. Don't know why EPA hasn't got it to me yet. After this meeting, I'll call the Regional Headquarters of EPA and talk with Harvey Scapegoat, and see if we can't get some action on this issue. Thanks for reminding me. I'll get one of my staff to draft a revision to the bill so that the self monitoring gets far closer scrutiny." So the Sierra Club attendees go home feeling like their Congressman is on top of the issue, is their friend, and will deal with the issue. Nothing could be further from the truth. He didn't know about the issue. He has no intention of doing anything about it. And he made EPA sound like they're dragging their feet. Congressman Blowhard has a good lunch, and in the afternoon he meets with members of the Northwest Coal Mining Association. They complain to him that EPA is driving the cost of coal up with unwarranted environmental regulations. Never mind that the pH of some Arizona streams rose a full unit when a power plant was taken off line for a few months. The sulphur emissions requirements were driving down the price of high-sulfur coal and the Mining Association's members are feeling the pinch. Congressman Blowhard knows about these issues, and he doesn't want to see a single job lost because of effective regulations of sulfur emissions. But he cannot say that directly, because the word might get back to his environmental constituents. So he chooses an easier path. Here is what he says. "Yes, I am aware of your concerns, in fact I have been in contact with EPA headquarters about this. I have told them that their approach is way to zealous, and has not adequately considered the economic impacts. I have a meeting with them as soon as I get back to D.C., and I will be really hammering on this point. In fact, I have drafted a bill to modify the emission standards. It should go to the committee in the next month." Again, the constituents believe the Congressman has their best interests at heart. He's working with EPA, that agency that just can't get it right, and he's even going to draft a bill. Yeah, right. Both bills are formulated and passed to committee. But when Congressman Blowhard submits them, he tells the Chairman that he never wants to see them come out of committee. This way, he can tell his constituents he submitted bills, and he can even show the bills to them. But neither has a hope of going anywhere. Think I'm kidding? Well, on average about 11,000 bills are written each year, and about 500 get passed. Many of those 10,500 others that "die in committee" were "just for show." And Congressman Blowhard deftly scapegoated EPA on both issues. That is politics in America today. The bureaucracy is scapegoated every single day, so Congressmen can look better than they are. And they're incredibly effective at this shell game. Statistics show that the general public has a low opinion of Congress as a group, but they usually feel that their own congressman is a remarkable exception to the rule. A journalist from the Orlando Sentinel, one Charlie Reese, has gained national attention from an article he wrote that blames Congress for all our countries political woes. It is worth reading. You can read it <here>. I find it too absolutist, because he places all the blame on 545 individuals in government, whereas I believe we citizens mostly get what we want, or are too lazy to change, or are too stupid to see. That is, some of the responsibility is directly on us voters. But this doesn't negate any of the points he makes. It just tells us that we have a job to do to fix it. 1.) It explains why I'm so proud of U.S. Geological Survey, one of the good parts of the Federal civil service -- that everybody loves to hate, thanks to Congress's scapegoating. 2.) It explains why I was happy to retire. You see, Congress had decided that scientific information from the Department of Interior Bureaus was too powerful, and it was hindering their ability to make politically expedient but scientifically invalid resource decisions. So they tried to abolish the scientific research arms of U.S.Geological Survey, U.S. Fish and Wildlife Service, National Park Service, and Bureau of Reclamation. Fortunately, the American public wouldn't stand for it. In the greatest letter campaign Congress has ever experienced, the plan to dissolve these research arms was squelched -- for the time being. But Newt Gingrich was unwilling to be utterly defeated in his quest to stupify the decisionmaking processes. What he could not do all at once, he decided to continue on a piecemeal basis. Fortunately for America, he soon fell into disfavor, and lost much of his power. But others of his ilk have continued the bit-by-bit dismantling efforts. There was no way to effectively prevent what was clearly happening, so I decided I didn't want to be part of the slow emasculation of some very fine government agencies and research arms. Retirement has been very good. My wife and I were full-time RV-ers for 7 years and half-time RV-ers for the last 4 years. We have RV-ed throughout most of Mexico, Canada, and the States. We now have a winter condominium in Mesa, Arizona, and spend the rest of our time in Oregon (our official home state) and traveling throughout North America. We have recently started branching out to trips outside of North America. We have visited 43 states (86 percent of them) thoroughly. We have been in the remaining eight states, but not sufficiently to know them well. of a day or two. 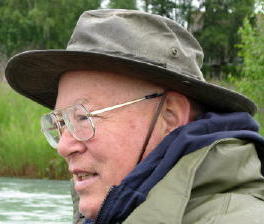 My interests are my wife; my kids and grandkids; travel; fishing for trout and salmon, particularly with a fly rod; computers, and web design; family history and genealogy; woodturning, technology; politics; and religion. The first three always are in that order. The rest tend to bounce around in priority, depending on the moment. As you learned early on, I am age 71. But don't let it fool you. I'm still young of mind. I take at least one college course each year, and spend lots of time studying on my own. I have a passion for learning. I have been happily married to the same wonderful woman for over 47 years. It just gets better and better. I love her dearly. One thing that I have acquired is the passion to complete whatever I start. So many folks dabble, but never quite finish. I don't get satisfaction from just dabbling. I like to see finished projects, finished products.